I have a mild obsession with pierogi. I would be lying if I said that it wasn’t the only one of the major contributing factors in my decision to visit Poland when I lived in Spain. 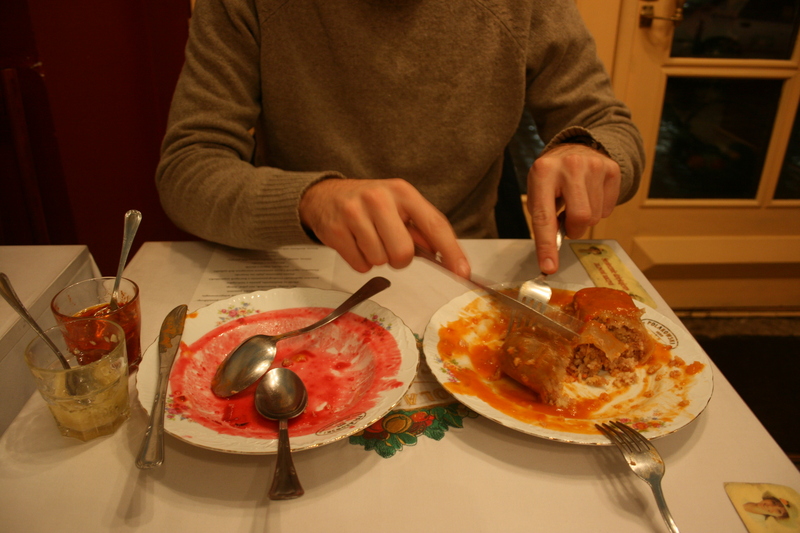 And I am proud to say that even though Marshal and I only spent 2 days in Krakow, we managed to eat at least four different meals of pierogi (in addition to our meals of barszcz bigos, zurek, gołąbki….I could go on and on but I will spare you the gory details). A plate of pierogi ruskie in Krakow. My grandmother has a fabulous recipe for pierogi that she has passed down to my mother, and every year at Christmas, my family (just the five of us), makes an absolutely insane number of these delicious little dumplings. I think we made 125 last year. You can do the math, that is a lot of pierogi per person. And we always eat them all within a few days. It’s a ton of work since you have to make the dough from scratch, make the filling, roll everything out by hand, cut each and every little circle, and crimp each dumpling closed before they get boiled. The dough is finicky and dries out fast, so everything has to move very quickly or else your pierogi won’t be elastic enough to stretch around their filling and hold together in the boiling water. But oh, is it worth it. Pierogi waiting to be boiled. The damp cloth keeps them from drying out. 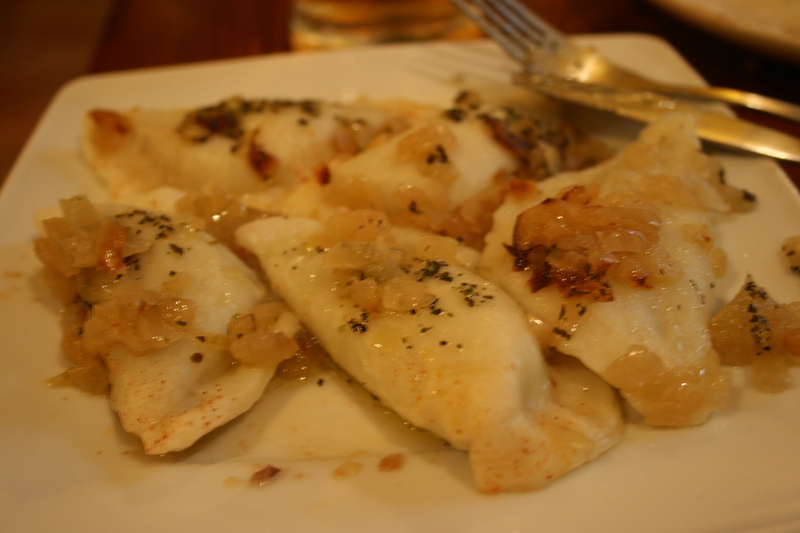 The lighter colored pierogi are ruskie, filled with potato, onion, and farmer’s cheese. The darker variety are filled with chipped roast beef and raw egg. My grandmother’s recipe is for the very traditional pierogi ruskie, which are filled with a wonderful mixture of smoothly mashed potatoes, onions, and farmer’s cheese, and we usually eat them topped with tons of onions that have been cooked in loads of butter until they are tender and sweet. There is another variety that is even tastier, and that one gets filled with a mixture of chipped roast beef from the deli and raw egg, which cooks when the pierogi are boiled….that’s it, simple as that. I have no idea if this is a traditional filling, but according to the internet there are other people out there that do this, and according to a bunch of menus I looked at in Krakow people will put just about anything into pierogi! It’s also delicious, so traditional or not, we are going to keep on keeping on with this recipe. One of our favorites from Krakow was a lamb and thyme filled variety from a Van Gogh-themed pierogi place (seriously) called Pierozki U Vincenta. Lamb and thyme filled pierogi from Pierozki U Vincenta in Krakow. Covered in buttery onions, of course. So the Christmas after my pierogi-tasting tour of Krakow, we got inspired. We made all kinds of weird pierogi, some with ham and swiss on the inside, some with chocolate and peanut butter….we basically stuffed the extra dough with whatever we could find around the house. I have to say, you probably shouldn’t try the chocolate peanut butter variety anytime soon, but the ham and cheese were pretty tasty, and the varieties I had tried in Krakow told me that there were more options out there! So today, I was browsing the internet, as I am want to do, I magically stumbled upon this blog: The Perogy Project. Now, the author and I may spell pierogi differently, but that has no effect on the massive amount of delight that overtook me when I realized that there was a blog out there about making pierogi with all kinds of crazy fillings!! I am even more delighted that it has been updated fairly recently and that it might provide me with some additional inspiration before the holidays hit. Until then, I’ll just have to rely on the frozen pelmeni from this place. They are like little Russian baby pierogi! So I am currently sitting in my bed eating ice cream. It is about 11 o’clock p.m. and I have been here all day. The great thing is, I feel absolutely ok about it because: a. it is Sunday here, meaning there is absolutely nothing to do unless you want to go to church or buy bread from a bakery, and b. I just got home from a week-long trip that covered four countries and I am exhausted! And ice cream is actually the only food I have left. I should also mention that I slept until 3:30 today. 3:30p.m. Marshal and I left a week ago for our adventure, which included a short stop in London, two days in Krakow, two days in Prague, and then one last short stop in Dublin. 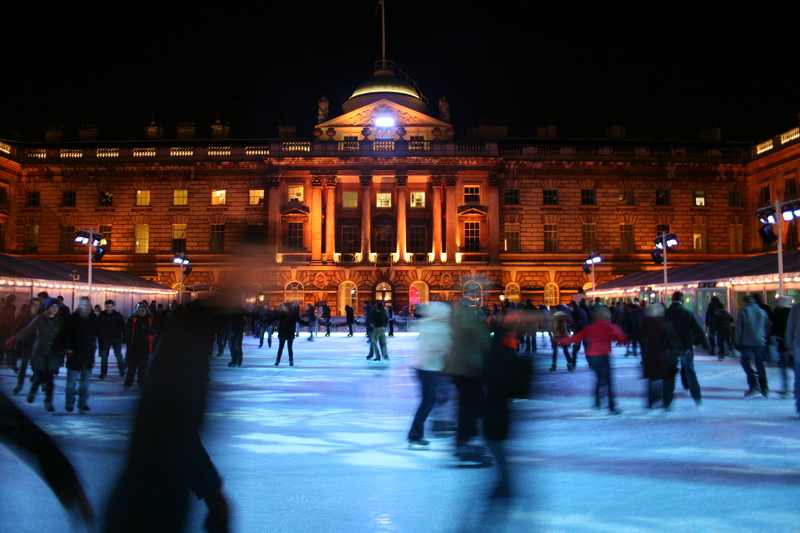 The itinerary was a bit crazy, but it ended up working out beautifully! The London part of the trip ended up being shorter than expected due to a delay with our flight and a rather long bus trip from the airport to the city. We ended up arriving around 6 to a dark and soggy city. Everything was closed since it was a Sunday night, but there were plenty of people out in the street and it was quite Christmas-y, so I was happy. We ended up eating two (TWO!) 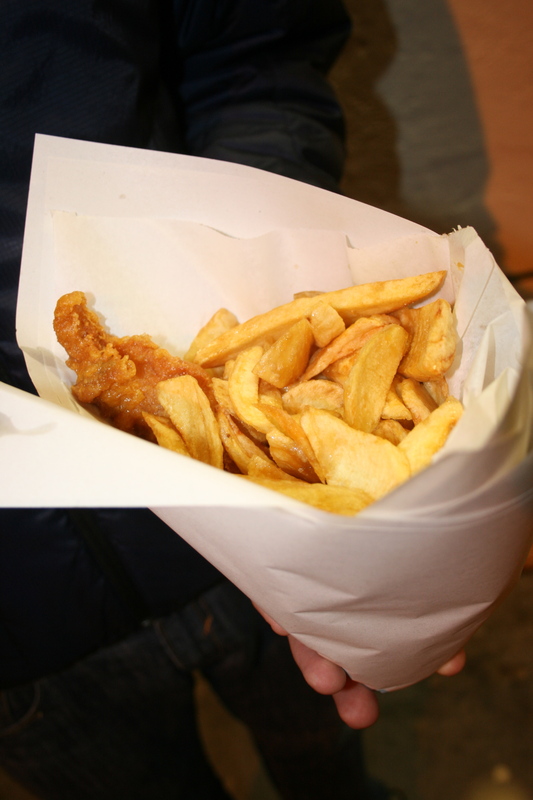 different servings of fish and chips to get into the London spirit (and also we couldn’t afford anything else). The first one was terrible, but the second one from Rock and Sole Plaice was rather nice and we got to eat it in a paper cone as we walked around Covent Garden which is a very agreeable neighborhood, even when all the shops are closed. After a bit more of a walk around Covent Garden, we stopped in for a drink at a pub, then walked around some more. The only thing we could afford to do after that was have coffee and meander back to the airport, so that’s what we did. 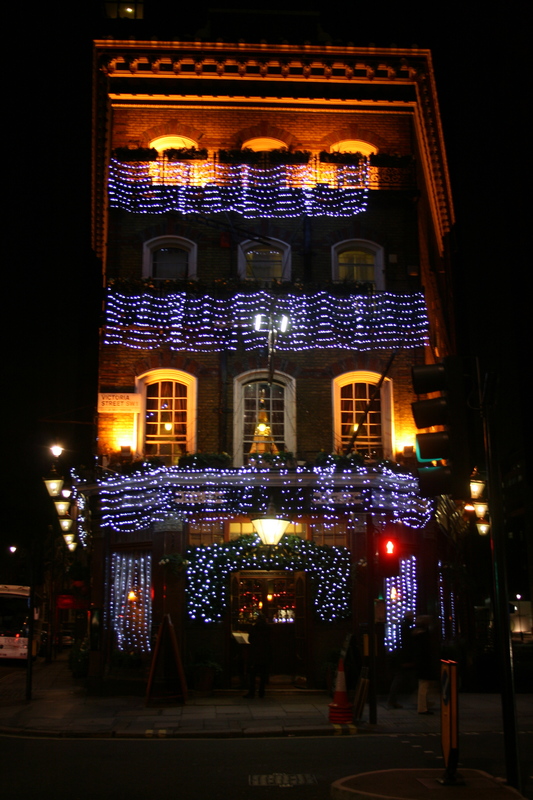 Even though we didn’t get to do much in London, everything was lit up for Christmas and it was nice and weird to be in an English-speaking country for the first time since September. It was actually my first time out of Spain since I arrived, so it was a breath of fresh, Christmas-y air. Unfortunately, the Christmas-y air ended with our return to the airport. We arrived there around midnight and didn’t have our flight until about 6. Sooo we slept on the floor. There were about 50 other people doing the same thing, so it felt more like a weird sleepover than being homeless, which was nice. We almost slept under a Christmas tree, but I decided that was a little too sad and street-urchin like for me. So we slept next to a newsstand instead. Oh Krakow! I love Krakow so much. I admit, I am biased because I am in love with Polish food, but considering how high my expectations were for this trip, it’s really amazing how happy I was with everything. We only had about two days to spend there, but I made sure that we spent as much time as possible eating. Within the first hour, we had already consumed an obwarzanek (a ring-shaped bread that is actually believed to be the ancient ancestor of the modern bagel) which are sold from carts ALL OVER the city for the equivalent of about 30 cents, and then we had moved on to the main event…pierogi. Our first stop for pierogi was Zapiecek which had received some pretty favorable reviews on http://www.cracow-life.com, a really amazing website for anyone going to Krakow. 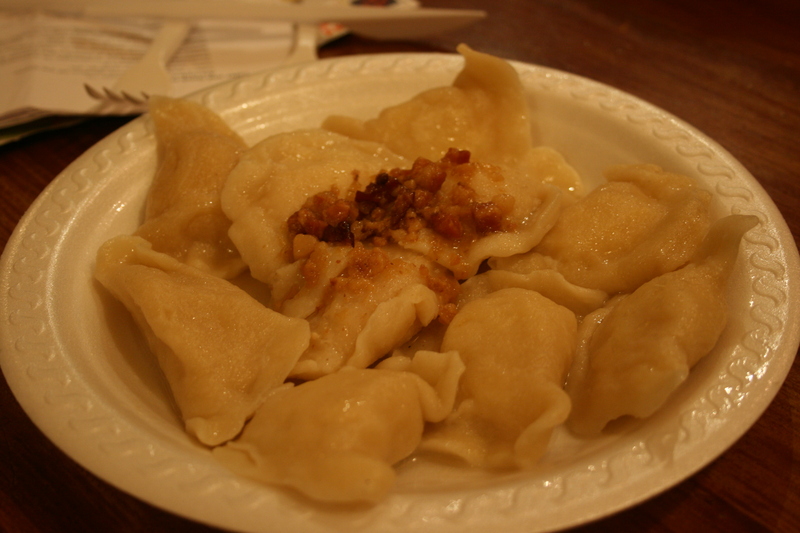 We shared a plate of Ruskie Pierogi which cost the equivalent of about two euros for ten delicious little morsels. The place is suuupper small so we shared a four-seat table with two lovely old Polish ladies who didn’t speak English. They did manage to ask us “Good?” while we were eating, and we enthusiastically replied in the affirmative. It was very, very good. Next we walked around the glorious main square, which is the largest medieval square in Europe. It was filled with little stalls selling ornaments and food, including pierogi, kielbasa, and sooo many more wonderful things. We were completely focused on one offering however: grzaniec: hot spiced wine. At under a euro per cup, we were hooked. I think we each had four or five the first day. They had these giant barrels set up in the square with little windows on the ends where you could order from a girl inside. Each time we either butchered the pronunciation or didn’t even try. Polish is a ridiculously weird language. We also managed to fit in a trip to another restaurant that I had heard about, U Babci Maliny, which translates to “Raspberry Grandma” or something weird. This place was fantastic and sooo cheap. I honestly wish we had time to go back and try a few more things from their incredibly long menu. 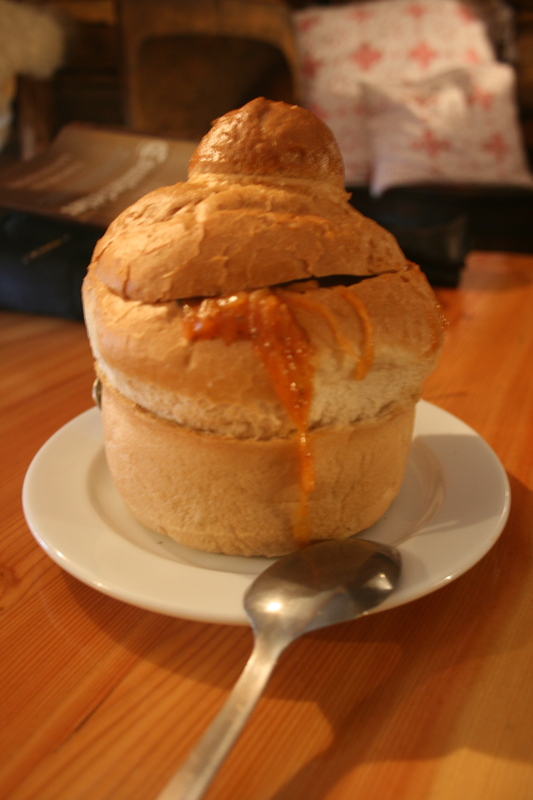 We opted to share the Bigos, or sauerkraut stew with sausage that came presented in the most adorable bread bowl I have ever seen. It was amazing. After gorging ourselves for the entire day and doing a few cultural things like visiting the cathedral (gorgeous, but no photos allowed unless you paid! ), we met up with Jarek and Aneta, the couple that we couchsurfed with. They live in Nowa Huta, the part of Krakow that was built up during the ’50s to serve as housing for the workers in the steel plant outside the city. The apartment was small and cramped and exactly what you would expect from a communist-era worker’s lodging, but it was really cool to see something outside of the Old Town and Jarek and Aneta were amazing hosts. They made us a little dinner of a variety of cold foods (which was about all we could handle after our day of solid eating), including home-made dandelion honey, pickles made by Jarek’s stepdad, smalec (surprisingly good), cheese, sausage, and some other delicious things. 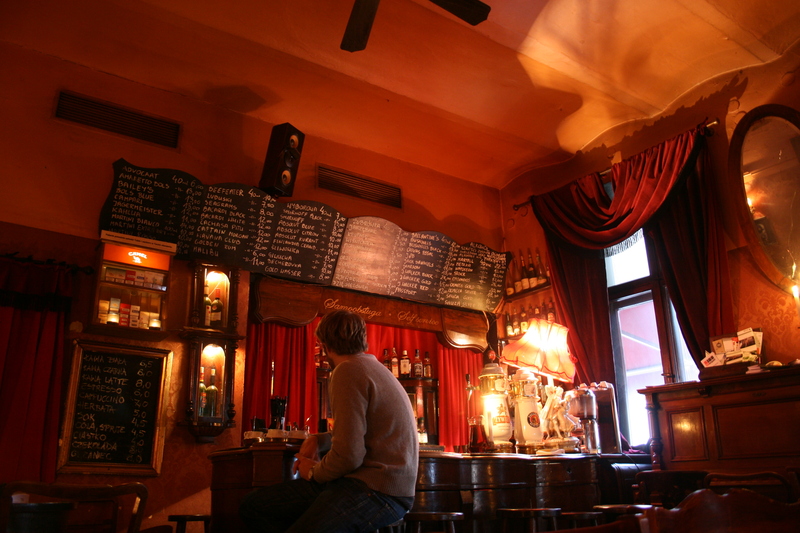 We also had some nice vodka, a must-do in Poland, and it was actually really good, not like the vodka I was used to. It was much stronger, much less like rubbing alcohol, and really burned on the way down. All in all, our first couchsurfing experience was a fantastic, delicious experience. The next morning we woke up early to head back into town and Jarek headed to school to give a presentation on the mechanics of a clutch? (he is an engineering student) We decided to do some more eating, of course, and managed to make it to three different restaurants! 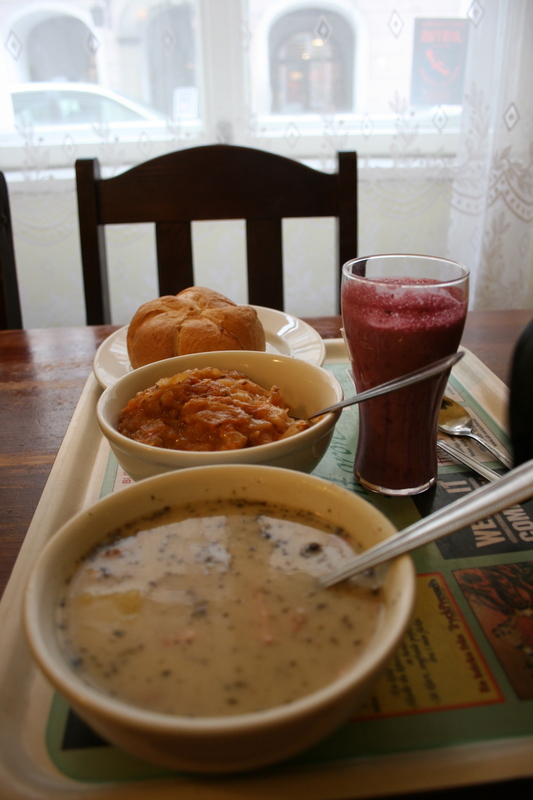 The first was a “milk bar” or “bar mleczny.” It’s a type of cafeteria-style eatery that came about in communist times when restaurants didn’t really exist and cheap food with simple ingredients was the only option. With the end of communism, most of the milk bars were replaced or put out of business by normal restaurants, but there are still a few of them around Krakow, and they are still dirt cheap. We went in around 9am and the kitchen was already bustling with all kinds of food. I went for the zurek, a white sour rye soup with sausage, and Marshal again had Bigos. We also each got a coffee, some bread, and a nice yogurty berry smoothie. The whole thing came to about five euros. Poland is seriously amazing. 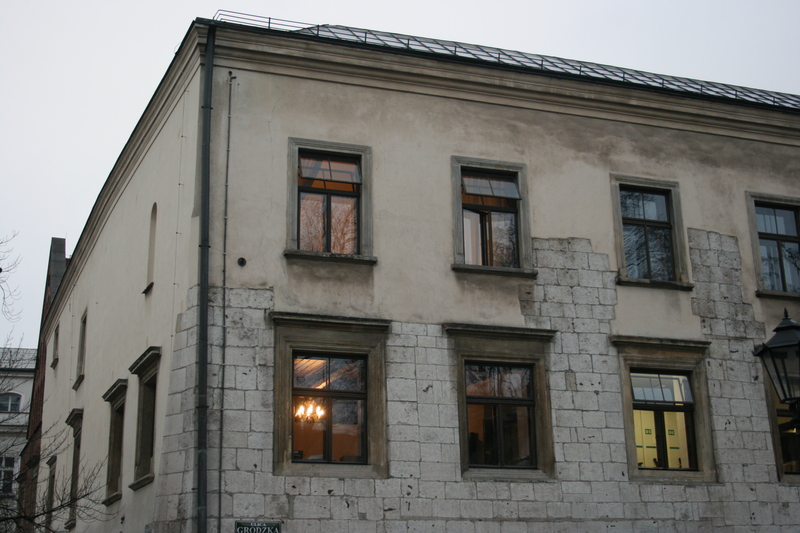 Then we decided that it was time to see some of Poland outside of its various eateries, so we headed down to Kazimierz, the old Jewish district, and the palace. 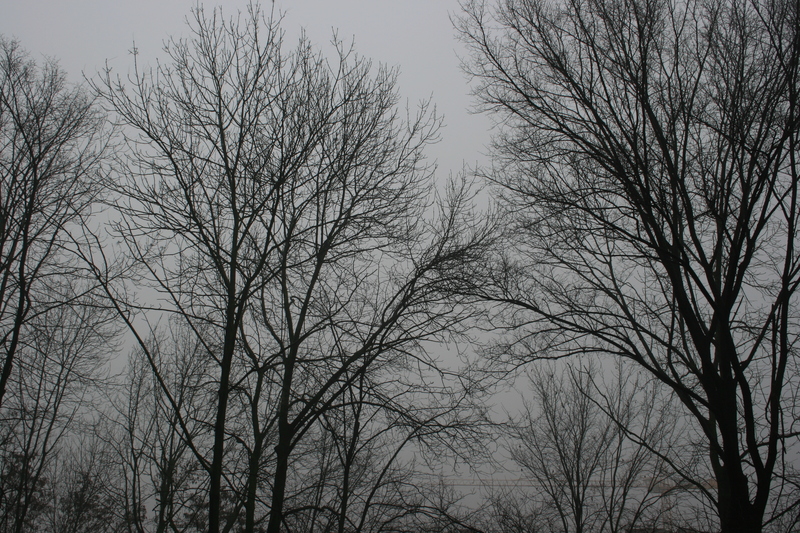 Krakow in general had a little bit of a sad, spooky air to it. I don’t know if it’s always like that, or if it was more due to the fog and the cold than the city itself, but it was really easy to think about all the terrible things that have happened here in the past. At several points during the trip I felt myself looking around and just feeling like any given street would make a perfect backdrop for a WWII era film. It just feels melancholy and dark, even when you’re doing nothing but walking around and eating and having a great time. Next time I go back, I am going to do the history of Krakow a little more justice. 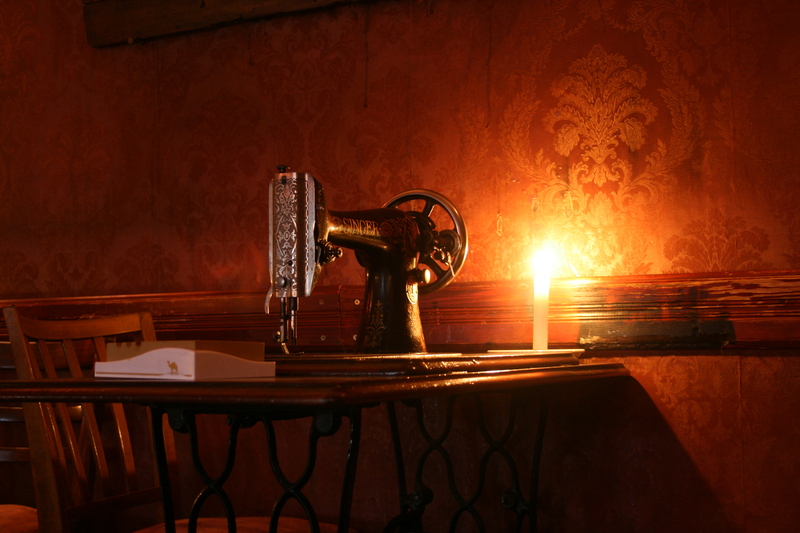 After visits to a bar called Singer (pictured above) where all the tables were old Singer sewing machines and the atmosphere was about a million times darker and dreamier than the rest of Krakow, we fit in two more restaurants, U Vincenta for pierogi and beers, and Polakowski for more cafeteria style food, this time Barzscz (borscht) and Golabki (stuffed cabbage). Both were amazing, though I think the meat/mushroom and lamb/thyme pierogi at U Vincenta were the best we had. Polakowski had the weirdest, tackiest decor ever and I loved it. Anyways, Poland and its food were awesome. We did some other things after eating, but honestly I am too tired right now to do any more uploading or discussing of Polish awesomeness. Tomorrow I will finish this, and update on Prague and Dublin. ¡Hasta mañana!